The majority of the following notes are taken from the Content Creation User Group (CCUG) meeting, held on Thursday, September 27th, 2018 at 13:00 SLT. These meetings are chaired by Vir Linden, and agenda notes, meeting SLurl, etc, are usually available on the Content Creation User Group wiki page. The Rakomelo Maintenance RC, version 5.1.9.519298, dated September 5th, was promoted to de facto release status on Wednesday, September 26th. This means all other viewers currently in the pipelines will be merged with this code and updated in the coming days. New environment asset types (Sky, Water, Day that can be stored in inventory and traded through the Marketplace / exchanged with others. The new LSL functions for finding the time of day according to the position of the windlight Sun or Moon have been completed, and are more accurate than the current options. Those who have been fortunate enough to attend the CCUG meetings have been able to get some advanced testing done, and there have been a number of additional bug reports and feature requests raised – use the EEP Jira filter to review all raised issues / ideas. The latest version of the test viewer (made available at the meeting) will result in visible changes to cloud speeds. This will cause clouds in settings created using the initial version of the test viewer to travel much faster and to the north-east. Another simple EEP demo showing how different textures used on the Sun or Moon within individual sky settings can be blended together when creating a day cycle & some of the motion effects – in this case the Sun (as Mars and Jupiter zig-zagging gently up and down). Oblateness is due to manual recording ratio, and is not representative of the texture shapes when seen in-world. 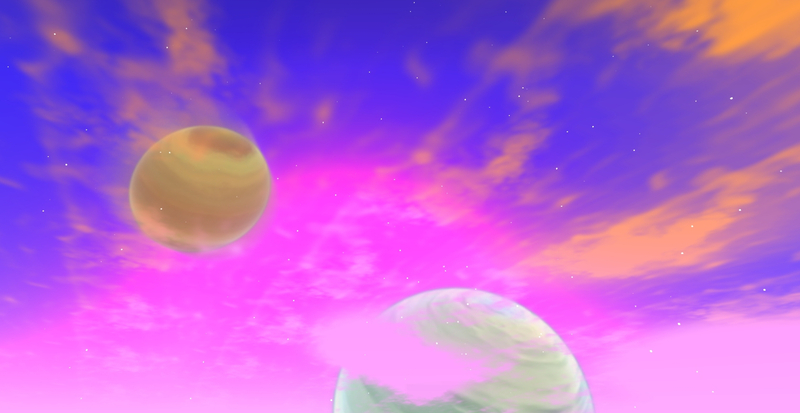 Graham Linden’s shader work has yet to be added to the viewer (so no crepuscular (God) rays, etc., as yet). Firestorm uses a broader range of setting for atmospheric / water effects (haze, density, etc.) than the official viewer. This has led to windlights imported into EEP settings not displaying correctly (see BUG-225537) Rider had increased the settings range in EEP to match Firestorm. EEP does not support the ability for anyone to create a new EEP settings object simply by saving the one they are viewing ( as can currently be done with legacy windlight settings). However, existing windlight settings stored locally in the viewer can be imported to EEP and converted. EEP will break RLV controls on windlight. The EEP test viewer can be used as an ordinary viewer on Agni (the main grid), but EEP settings cannot as yet be applied, and it may lead to a duplication of the EEP Settings folder when switching back to the test region on Aditi. Rider hopes to be able to add a means to provide a degree of perturbation when non-seamless cloud textures are used, so that they don’t appear so tiled when viewed in-world. Vir continues with bug fixing. In particular he believes he now has a fix for the “lagging rotation” issue where the rigged mesh of an Animesh object fails to keep pace with the rotation of the root prim. This fix should be in the next update to the viewer. Vir is also working on finalising the new constraints for scale and position with Animesh objects, and trying to clear “one or two minor issues”. Selecting Animesh / multiple Animesh objects: selecting Animesh can be an issue. This is a legacy issue with rigged mesh in general, and changing behaviour to make it easier is viewed as “dicey”. The suggestion is to try a right-click to select. BUG-216352 may not be fixed prior to Animesh moving to release status. Attachment support for Animesh remains a future project option. Bake Service Update to support 1024×1024 textures. The simulator and Bake Service updates should be deployed “soon”. (Feature request BUG-11775) Currently, the only way to change the colours of individual parts of a mesh object are to assign separate faces/materials (which in many cases requires adding more triangles) or to use completely separate textures, both of which result in a greater rendering complexity of the object / requires more data to be managed by the viewer. One way to reduce this could be through the use of colour maps / masks that indicates which parts of a mesh object should change colour when edited in the build menu, and which might function in a similar manner to alpha blending. The Lab has a series of feature requests and proposals for updating materials support within Second Life. While there is no current project on the cards for implementing them,BUG-11775 may be among the list of options for consideration, given it has been Accepted. The (roughly) 20-minute mark in the meeting saw a chat discussion on handling texture memory in the viewer, and how different TPVs address it. There is an official viewer in development which also revises the current texture memory limit (512 MB). The Advanced Inventory System (AIS) update, which is primarily related to work preparing Second Life for its move to a cloud-based infrastructure but which also contacts asset updates in support of EEP and Bakes on Mesh, had previously been reported as deployed to Agni (the main grid). It now appears there are still some servers still to receive it. The next CCUG meeting will be on Thursday, October 11th, 2018, at 13:00 SLT as usual. Someone… really… really… needs to inform the Lindens. Stars go BEHIND the planet/moon/sun, not in front of them. For the love of cheese, if nothing else, get the order right T_T. That’s always been the case with windlight (stars will appear in front of the clouds as well – although I suspect for those situation where they do pop-up in daylight, windlight creators simply turn star brightness off). No idea if it can be fixed – but it is for more noticeable with EEP than before, simply because we do have so much freedom of movement with the sun and moon texture slots . I’ve been meaning to check through the EEP Jira and see if this has been raised, but then forgetting in the course of a day – thanks for the reminder. It’s just a matter of the drawing order. You start off drawing the furthest thing away and then draw the rest of it over the top. Furthest object to closest ^_^. There really isn’t much in the way of an engineering challenge, it just requires you to think about the order while building the code. Not disputing the apparent simpleness of the drawing order; the challenge is in the way the code has been built, remember, SL had been built upon for 14 years (Windlight wasn’t even part of the original system), and has tended to become far more complicated than might appear to be the case. As it is, EEP isn’t a large-scale rebuild of the rendering code, it’s the addition of code to handle what is already there, and add a few extra bells and whistles to those existing capabilities. That said, I located BUG-6000, which relates to the issue & was accepted by the Lab; so it might be the work could be in the pipeline – or that it’s escaped recent notice. I’ll endeavour to find out more from the EEP team. I’ve also raised a bug report directly for EEP on the issue.